MMM Note: Freetown could be playing in a theater near you - if so check it out! Freetown delivers a miraculous missionary story with cinematography and music that transport you to Africa. If you enjoy faith-based movies, you’ll enjoy Freetown. I found the story remarkable, watching as the group of six missionaries make their way in a small sedan, driven by a local church member on unpredictable dirt roads, through several rebel-held check-points, across Liberia to Freetown, Sierra Leone. A mix of quick thinking and divine protection help them escape danger and safely make their way to the mission president’s home amid a civil war. Much of the story takes place as they travel in the car, making the film seem a bit claustrophobic, even though wide-angled countryside shots give you a good sense of the beautiful African landscape. I felt like some of the acting could have been stronger, and my nine year-old son asked a couple of times for a translation of what was being said due to the strong African English accents. Still, the film is well-made and the message of good Christian living is certainly worth two hours. The film Freetown tackled intense subject matter and relayed important messages about faith, doubt, and race. It's encouraging to see filmmakers seek to create or recreate authentic Mormon stories, of which Freetown was a great example. The story in this case was an important history, probably wholly unfamiliar to the audience who will see the film (American Mormons?). The acting was certainly amateur and leaves one wanting for more believe-ability at times. However, it is felt far more genuine to have African actors in a believable setting (hopefully gone are the "Testament" days of "dark-skinned" people being played by white actors with too much tanning-oil) which felt overall more "real" than the run-of-the-mill Mollywood film. The film presented the theme of cognitive dissonance as relating to the tribal violence in Liberia, as well as within the LDS Church's history. With the recent surge of membership in Africa, the Church's Priesthood ban for African descendants will have to be addressed. One of the missionaries in the film provided this explanation: we all make mistakes; even prophets and institutions, and all have need of Christ's Atonement: God rejoices in our repentance, regardless of who we are or what we did in the past. As one who listens to more soundtracks than movies, I was disappointed in Robert Elliot's work in this film. I enjoy his style: he fits in with the major prolific contemporaries like Hans Zimmer, Alexander Desplat etc. and worked wonders with creating the anxious, unsettling mood in The Saratov Approach. 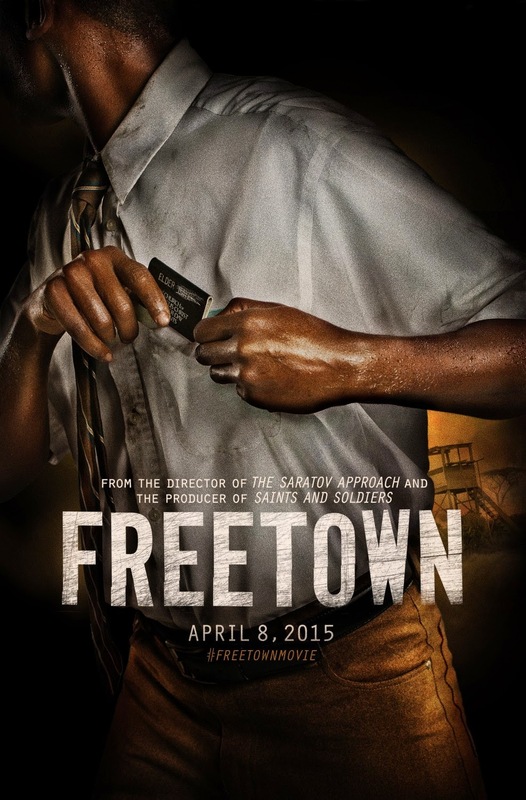 Freetown required a much different tempo, style, and mood-based on the subject matter. Elliot relied in similar musical patterns (even used redundant chord progressions from The Saratov Approach), and didn't quite make the necessary change I would've hoped for. I expected to be more thrilled than moved by Freetown. In fact, I was more moved than thrilled. The thriller aspects of the film are competent but not extraordinary. What is extraordinary is the sense of hope and joy the film imparts in balance to the despair and danger. And make no mistake: even though we expect the miracles the missionaries promise and all bloodletting is done offscreen, the reality of the violence and death and finality that was Liberia's civil war is utterly plain. One of the smart choices of the script is making the protagonist someone other than a missionary. Henry Adofo who plays Philip Abubakar is a powerful lead. He teeters between being a nobody and a hero---or, in other words, he's fully human and accepting of that. Something about being twenty and wearing a black tag that Broadway doesn't understand is the attendant joy of being nothing, and how being nothing leads to complete reliance on God and the ability to see all things as possible. Abubakar doesn't have the luxury of a black tag to render him nothing. Sure, death is no more real to him than it is for the missionaries, but he feels the weight of death differently, being the only adult in the car (which may be why, in the end, it will be his faith that's necessary if they are to survive). The film presents language intelligently, as we should expect when the words are penned by AML Award-winning playwright Melissa Leilani Larson. The film's score by Robert Allen Elliott is likewise suitable and intelligent. The problem is that these two strengths can bump into each other. Sometimes, what Freetown really needs, is some more faith in silence. That said, I think the best way to enjoy the film is to take a crowd to the theater. If it makes it to the East Bay, I plan to invite a lot of people. This is a movie that should be experienced communally. The story FREETOWN tells is compelling. While it is based on true events, I admit that I have no clue where it takes liberties with history. Were the missionaries really hunted by a vengeful rebel? Did the ending really happen the way it's portrayed in the film? I don't know and I don't think it matters. Freetown is a story that could happen. The characters are realistically drawn and the situations they find themselves in--including the miracles they encounter along the way--seem wholly plausible. It's an excellent follow-up to The Saratov Approach. I watched Freetown with my husband and 13 year old daughter. I would say that this film could be watched by those ages 10 and up, simply because it was a violent situation and although not gory, could trouble a younger child with so many guns. Although I hesitate to write this aspect, my family had a very hard time understanding the accent and in retrospect I think subtitles would have been helpful. It made it difficult to feel emotion when we were struggling so hard to understand each sentence. I felt like the character development was definitely lacking. The story itself is very powerful and it would have been nice to understand more background into their lives. With that said, my family agrees that the overall acting was well done and we felt great empathy for each person and situation. I think the cinematography was great and it felt like a high budget film. The scenery and atmosphere was captured in a way that really made me feel engrossed in the experience of that time. The message of perseverance during trial was received and my family walked away appreciating the sacrifices made by both Church Members and Missionaries. However, I think the ending would have been a greater relief had we again saw more character development in the beginning. We ended the film being slightly disappointed and wanting more to the story. I give a 3 1/2 star rating out of 5. The term "Mormon movie" feels me with dread more than anything else, as the market's been saturated by substandard product, but Freetown gives us something we've never seen before. Filmed on location in Liberia, with a mostly Liberian cast, we follow a group of missionaries who get caught in the cross-hairs of the rebellion in 1989. The movie takes its opportunities to preach, but it's mostly a suspenseful film as they try to make their way to safety. The cinematography takes advantage of the gorgeous location, and the acting, while amateur, is up to the task. I liked how they addressed the issue of priesthood and race head-on, and I liked the build-up during the third act. In fact I'd say the second half is stronger than the first half. Overall, I liked it. This Sunday I drove my car two blocks to our church building. I walked inside to nicely air-conditioned facility, I sat on the cushioned pew, and after exchanging pleasantries with several friends in my congregation I quietly contemplating the in preparation for the service. The speakers at our church service were inspiring, I felt humbled by some as I explored my own weaknesses and others inspired me to do better and to change some of the old simple behaviors of the natural man. I left the service feeling that I had communed with God and walked away edified. Later that evening I watched the movie Freetown that depicts the story of a group of native Liberian mormon missionaries who make a desperate cross-country trip through their war torn country to save one of their own. I realized the stark difference between the kind of worship that I have participated in that day and the great sacrifices individuals in different countries and different times have experienced in their effort to worship. Freetown follows the story of these LDS missionaries attempting to preach the gospel in a land that is hostile and fraught with political distress. The sacrifices that they make in order to peacefully preach and to safely worship our extensive and frightening to say the least. Their journey to Freetown which is appropriately named for the metaphoric struggle that they experience is one full of miracles and humor. While the experience of those missionaries and church leader that helped them is no laughing matter, they were able to find faith, humor and success in their journey to freedom. For someone that is not a member of the Church of Jesus Christ of latter-day Saints, the nuances of this film may get lost. But it is not hard to imagine the fear and difficulty associated with their experience. As a member of the church the movie help me to remember that some of the sacrifices that occurred for those at the beginning and establishment of our religion in the early days of the United States, is still current in other parts of the world as the work of the Lord moves forward. There are plenty of criticisms associated with the making of the film. The editing and its pace of the storyline could have been sharper, But this genera of LDS filmmaking is getting better over time. With the making of The Saratov Approach, and Freetown, these films are leaving the campy stereotypes of Mormonism and becoming more real and relevant in the world we live in that is full of religious and political dissent. I hope that in my desire to worship I never have to worry the way that Elder Gaye of the Krahn clan had to worry in the movie Freetown or in his real life. I'm blessed to drive just a few blocks to my church building to worship and I can do so with out armed rebels bursting in and threatening me and those that worship with me. The world is diverse, different and unpredictable. What is not different is that whether you're in Monrovia, Mississippi, or the Mormon capital of Utah, for every man in whatever his situation we all kneel on her knees in the same way, and prayed to God that loves us all the same.